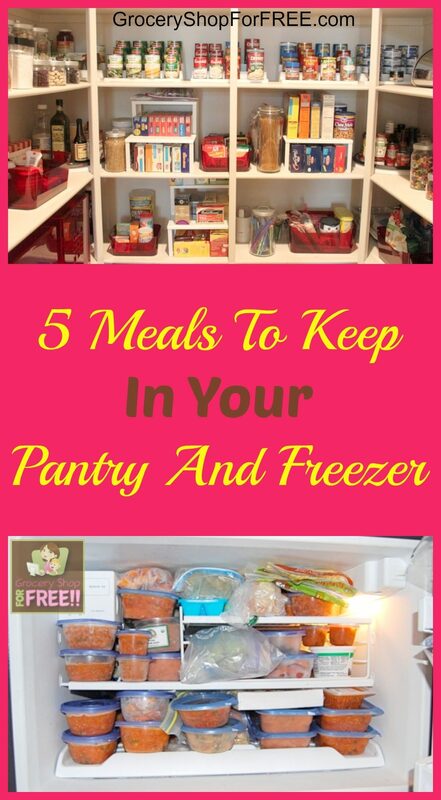 5 Meals To Keep In Your Pantry And Freezer! You are here: Home / Recipes / Dinner / 5 Meals To Keep In Your Pantry And Freezer! Do you ever have those weeks when life just happens? Boy, we do! Even the best meal plan can’t possibly account for times when life throws a curve ball. To counteract the craziness, I like to keep my pantry and freezer stocked with several meals that can be made in a pinch. 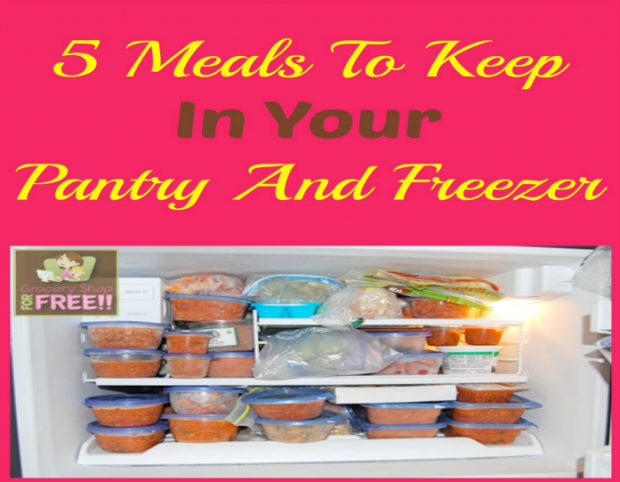 I try to keep some frozen browned ground beef and cooked, cubed chicken in my freezer to help with quick meals. I also try to keep a good supply of shredded mozzarella and cheddar cheeses in my freezer. Here are some of my favorite quick meal ideas. Mix it all together without draining anything and heat. You can even throw this in the Crock Pot for a few hours or all day. Sometimes we add some browned ground beef or cooked chicken to it. Tonight I cooked up 3/4 of a box of Piccolini pasta until it was al dente. Mix in the rest and heat through. Mix ingredients in order listed in bread machine. I use my bread cycle, and my machine beeps when dough is ready. You may have to consult your machine’s book to know when yours is done. In a pinch, you can just knead the dough by hand for five minutes. Place dough on pizza pan sprayed with canola oil, and spread the dough to cover the pan. Bake at 450 degrees for 5 minutes. Add sauce, toppings, and cheese. Bake another 8-10 minutes at 450 degrees. If I have pitas or English muffins on hand, I’ll use those in place of homemade crust. Mix refried beans, salsa, and chicken. Divide the mix among the tortillas. Roll each tortilla, and place seam side down in a 13 x 9 inch baking pan sprayed with canola oil spray. Bake uncovered at 350 for 15 minutes. Sprinkle with cheese, and bake another 5-10 minutes, until cheese is melted. You can’t bypass the old stand-by! I like to keep several types of canned soups in my pantry so that we can use them in a pinch. What are your favorite meals to keep on hand? Do you have any advice for making meals in a pinch? Jennifer is wife to Jason and mom to almost-six-year-old Emma. She blogs at The Simple Pen where she helps readers save more, spend less, and give generously. Thanks! One of our favorite go to meals: Cream tuna fish on toast. Yep sounds gross. Don’t knock it till you try it. Toast (1-2 pieces per person) Frozen peas cooked. Sauce: 1/4 c butter melted in saucepan, 1/4 c flour (whisk with melted butter), add 1 c milk. Salt and pepper to taste. Whisk to boiling. Remove from heat. We triple this sauce for our family of 7. We then break up the bread into bite sized pieces. Pour sauce over bread. Add peas on top for each serving. My husband likes to leave the bread whole with sauce on top and peas on top. Go to meal in 10 min!! That sounds great! I love tuna and peas. I used to make a tuna casserole with peas in it! I do love that! I had never eaten it until my kids were small and it was served at their school! Those sound fast and delicious! thanks for sharing! These are great, going to try the 5 can soup tomorrow. I think my new favorite quick stand by is crock pot mashed potatoes..
That and I can’t figure it out.please let me know . I know this is an old post, but I thought I’d add something anyway. I like to keep turkey smoked sausage around. It’s great with noodles, in a wrap or just by itself. I like it with pineapple and steamed carrots. We also do the breakfast for dinner with scrambled eggs and toast, fruit. I have a chronic illness, so it’s especially important to have easy meals on hand for those days where I’m not up to cooking.